Multi-surface roller set, grey 20550070 https://www.kaercher.com/ie/accessory/multi-surface-roller-set-grey-20550070.html Two-piece microfiber roller set for the FC5 Hard Floor Cleaner in grey. Being lint-free and extremely absorbent and durable. 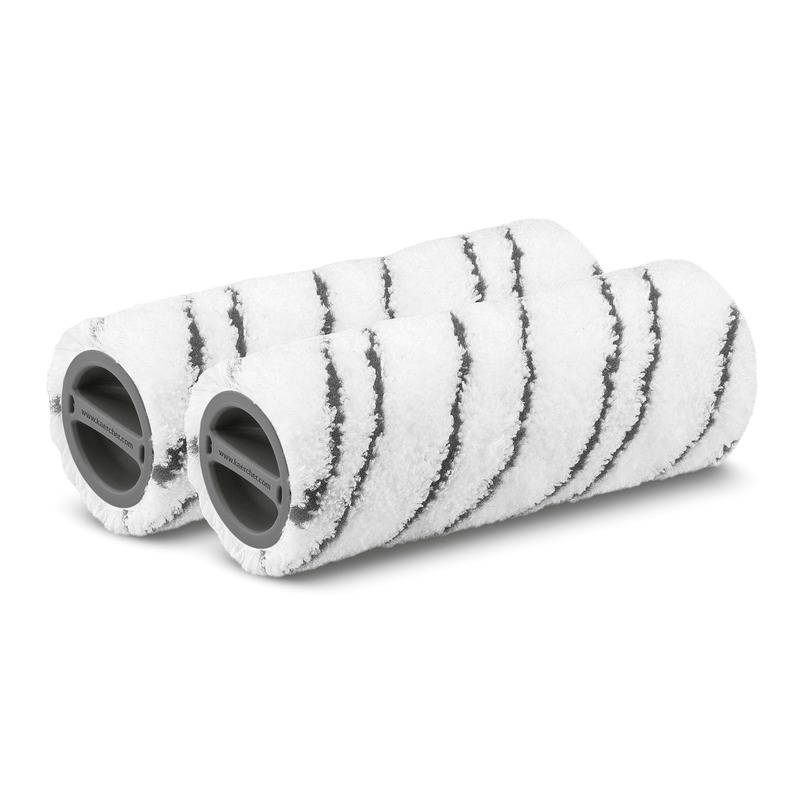 Two-piece microfiber roller set for the FC5 Hard Floor Cleaner in grey. Being lint-free and extremely absorbent and durable. Two-piece microfibre roller set for the Kärcher Hard floor cleaner enables gentle washing and care for all hard floors, including wooden flooring. Being available in two different colours enables you to have a set for the different areas of your home, for example the bathroom and kitchen. The rollers are lint-free, extremely absorbent and durable. They are machine washable up to 60°C. Multi-surface roller set, grey is rated 4.3 out of 5 by 12. Rated 3 out of 5 by Sutera from easy to use Used it for the first time on 1200 sf of polished smooth slate floor, 18" grid tiles with 3/8" grout seams. Picked up lots of dirt, but left anything that had dried on - like fallen flower petals. I (and my cleaning lady, who had similar reaction)would like this unit a lot better if the brushes had scrubbing power. Its much quieter than I expected. Dries fast. I suspect its best for hardwood floors in bedroom and living room environments. I don't recommend for kitchen areas. Rated 5 out of 5 by Peteraries from Exceptional I thought my vinyl and wood floors were clean until I used my new FC5. Firstly it's easy to use, secondly, when I I emptied the dirty water container it was a depressing shade of grey! We have no carpets in our large three bedroom apartment so this top quality and labour saving device. The rollers come off with a twist and I wash mine with my clothes in the washing machine--easy! I'm amazed at the couple of negative remarks in other reviews. The couple I saw were because of misuse or lack of common sense. Rated 2 out of 5 by Pamo from Not so good I have used this item 6 times, on both laminate floor and tiles. It does pick up cat hair and debris but does not clean the tile floor very efficiently. I usually have to remove the stain/mark by bending down and cleaning by hand. Also, I find the water from the container to wet/wash the floor is not always consistant. Rated 3 out of 5 by How250 from Great Product but can't seem to buy replacements I bought a FC5 floor cleaner I love the product but am trying to find a spare set of rollers and some detergent. The Karcher website lists the product but can't seem to order it. Also called several times but it appears the customer service only supports commercial products. I've spent two hours trying to get to the right people with no results. All the dealers listed don't carry the product. I would like to recommend this product to others except you can't seem to buy supplies from anyone I purchased the machine on Amazon but can't get supplies from them either.